Why measure? K-jet mechanical fuel injection depends on continuous regulation and variation of fuel pressure delivered to the injectors. 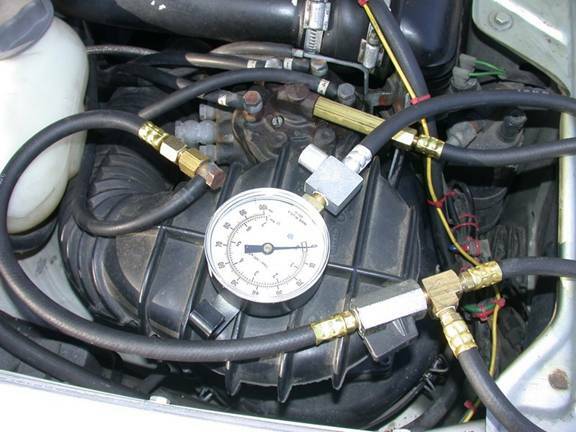 Line (or system) pressure readings will help define a problem with the fuel delivery system such as the pumps and filter. 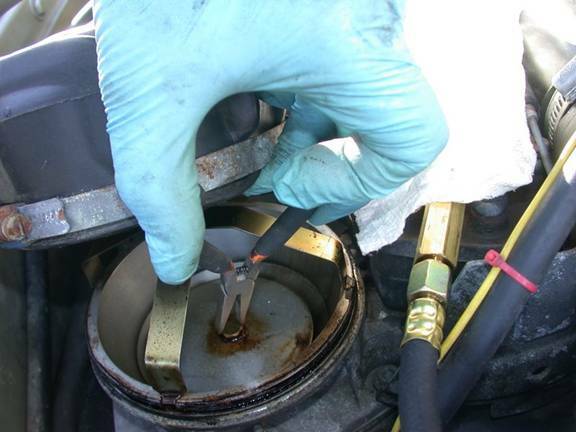 Residual system pressure checks may help identify a check valve, accumulator, or injector fault. 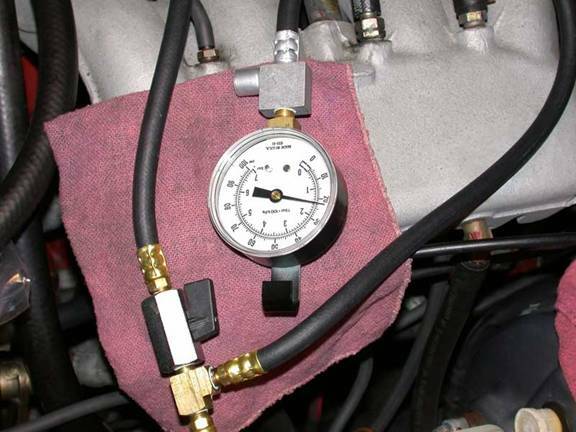 Control pressure readings qualify the mixture adjustment that must be made through the cold start and warm-up process. 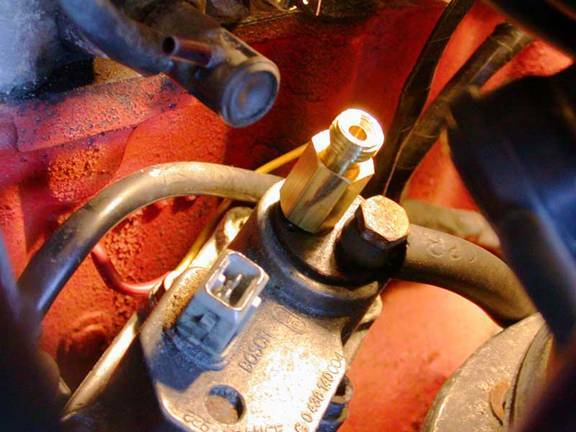 1) Remote switch to turn pumps on – home made from a salvaged fog lamp switch. This is handy for various no-helper tasks, not just k-jet service. 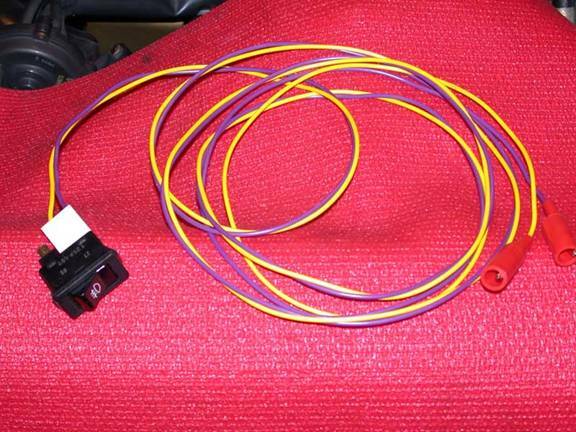 2) Electrical adapter to switch power to the Control Pressure Regulator (CPR). Home made from a salvaged harness connector and a cigar lighter cable. I took care to be sure my CPR was not one with an internal ground on the heater element before connecting this, otherwise polarity of the plug would have been critical. 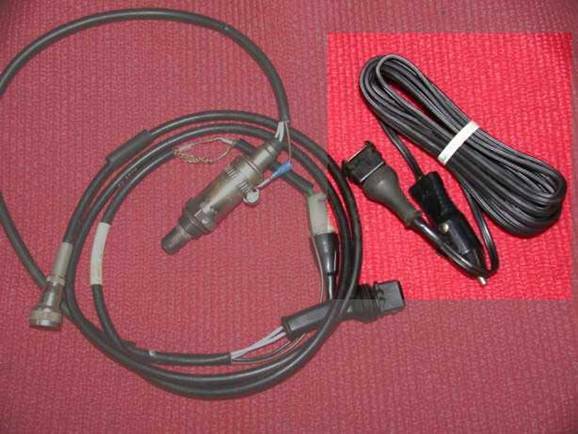 3) Fuel Injection Tester for CIS-K-Jetronic Fuel Injection – Kit purchased from JC Whitney SKU# 1JA 123617 – a Hoffman TU14 Tester. Note, the photo in JCW’s catalog is still not correct as of Sept. 2010. The banjo fittings in this image are from my junk box. Working outdoors, you might find this an unnecessary step, but I preferred to release the system residual pressure and that fuel in the accumulator, in a controlled fashion. 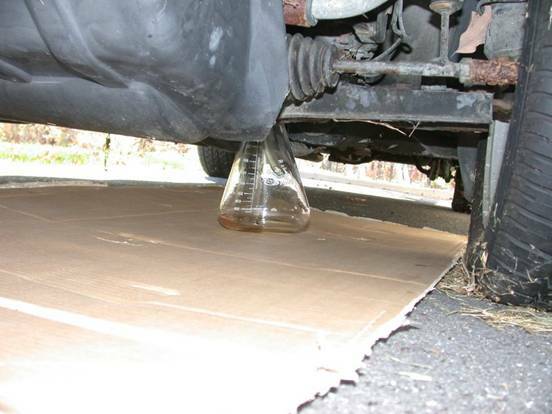 The funnel is made from vinyl hose and an unused (doesn't fit 240's) transmission fluid funnel. 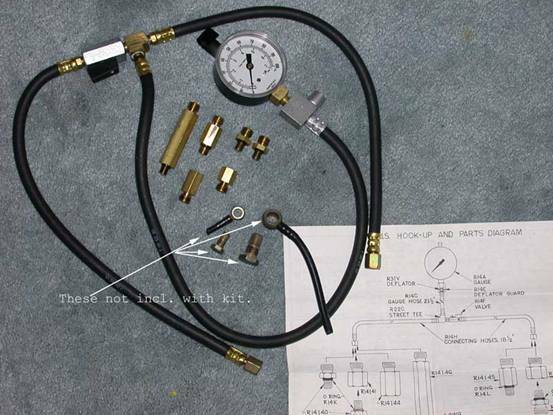 The pressure tester has two connections with a valve to block one of them. 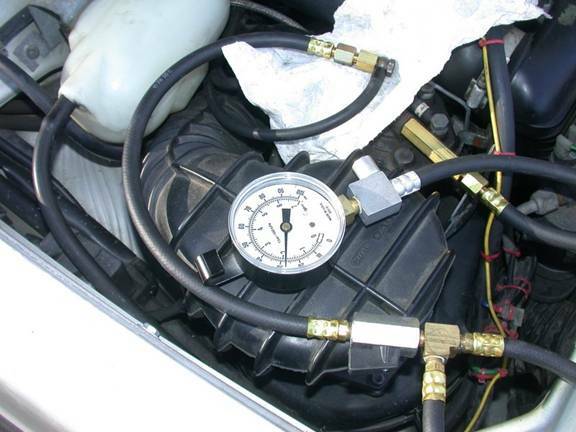 It is inserted in series with the fuel flow from fuel distributor to the CPR (aka warm up regulator). 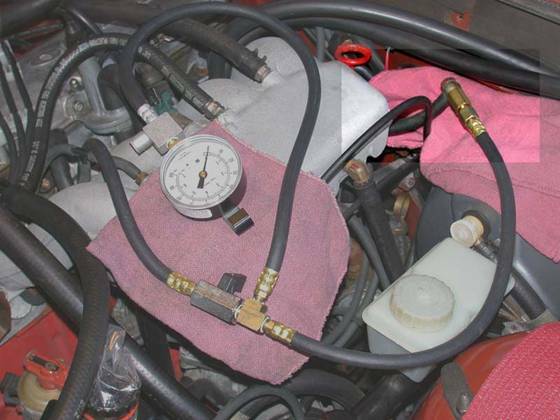 The valved port is connected to the CPR inlet, so shutting off the flow will permit the gauge to read full system pressure. 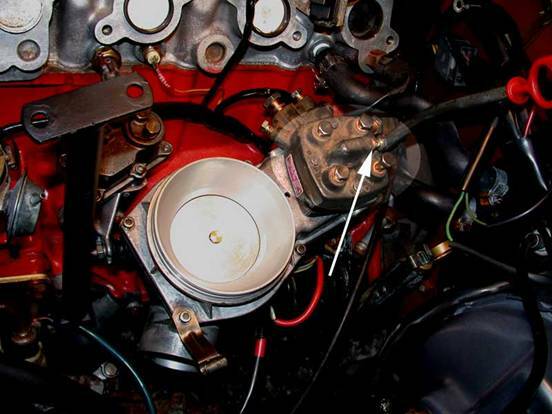 Opening the valve to allow flow exposes the gauge to control pressure. This shows the CPR inlet. 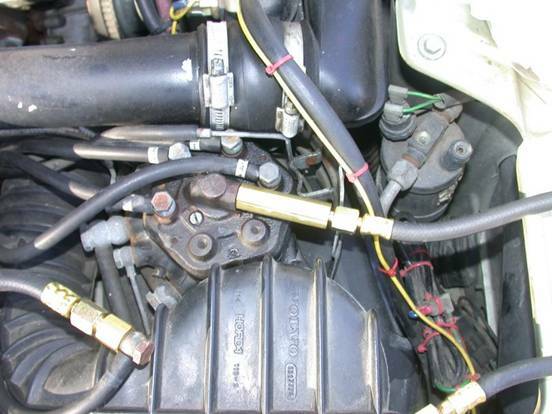 The CPR is located low on the block, under intake manifold ports 1 and 2, just behind the ignition distributor. This is the place I tap in, on the naturally aspirated (79) k-jet. 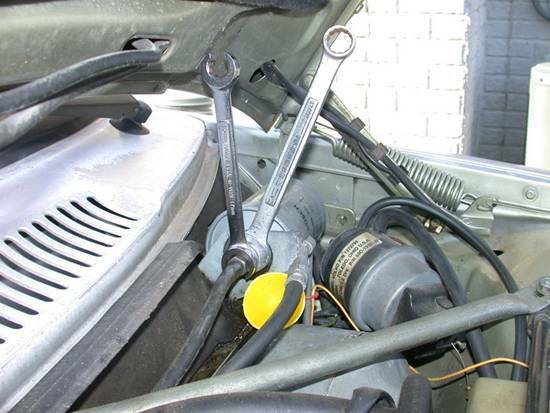 So much easier to reach on the 83 turbo, if tapped-in right at the fuel distributor. This photo underneath the manifold of the 79 clearly identifies the origin of the line that supplies the CPR inlet, though if I had verified this, it was by feel, not sight. 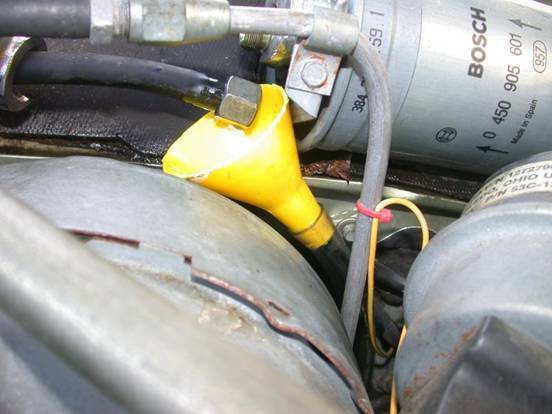 On the 79, I disconnected the fuel line at the CPR inlet and carefully snaked the rubber-covered nylon tubing behind the air/fuel unit (AFU) and upward to where I could conveniently attach the banjo bolt, with the fittings supplied with the gauge kit, to the gauge hose without the valve. The fittings supplied adapt to the banjo and banjo bolt with copper washer gaskets. Then, on the 79, I attached the remaining gauge hose to the CPR inlet port. I am fairly lucky with these copper gaskets used in the fuel lines, dressing them with first 240, then 400 grit, moistened with a squirt of WD-40 or kerosene. 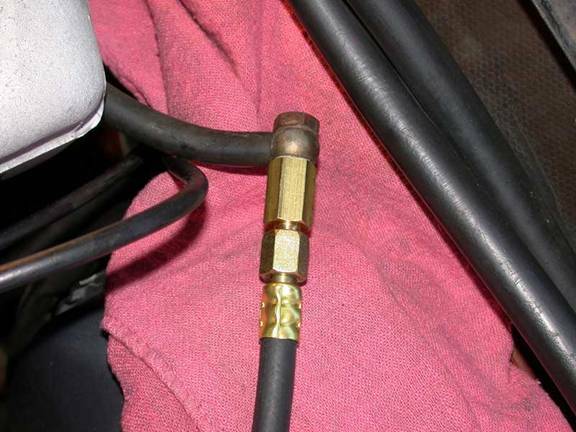 The gauge hose connects to the flare fitting adapter. The bend is rather tight here, but workable. Using the pressure tester on the 83 turbo is much easier. The CPR line is the one joining the top-most fitting on the fuel distributor. 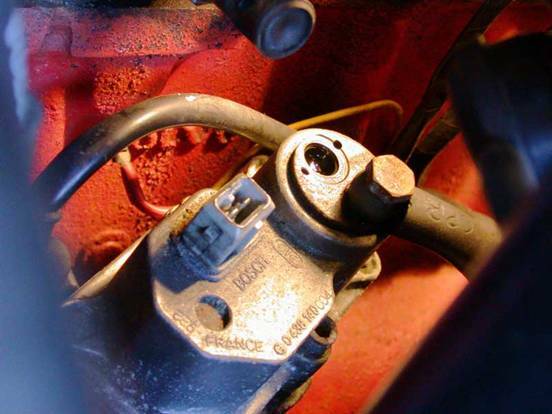 The pumps are run bypassing the fuel pump relay, on this 79, by connecting fuse 5 to battery, which appears on fuse 7. 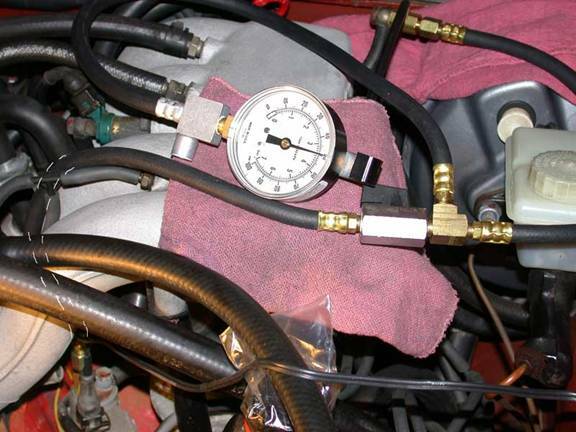 With the gauge valve open, control pressure is measured. 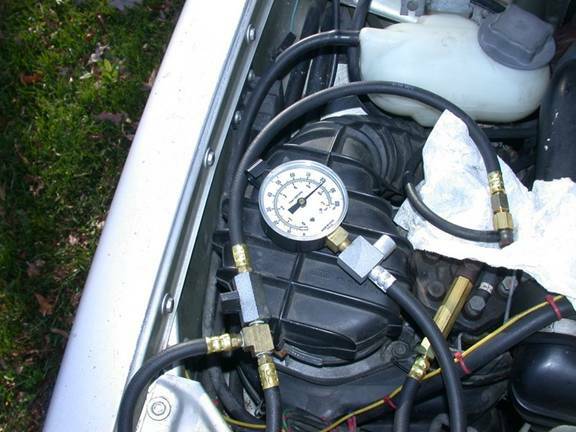 The gauge shows 22 pounds or 1.5 bar with the CPR as yet, unheated. I consulted the temperature vs. pressure chart for this 004 CPR in Volvo’s service information. The reading corresponds with the outdoor temperature – about 60 degrees Fahrenheit. Here's the turbo, on a warmer day. Here I have the CPR heater powered and warmed up to measure 50 pounds control pressure. My green book says to expect 50-54 pounds pressure after 5 minute electrical warm up. Finally, line, or system pressure is measured by closing off the path to the CPR inlet. 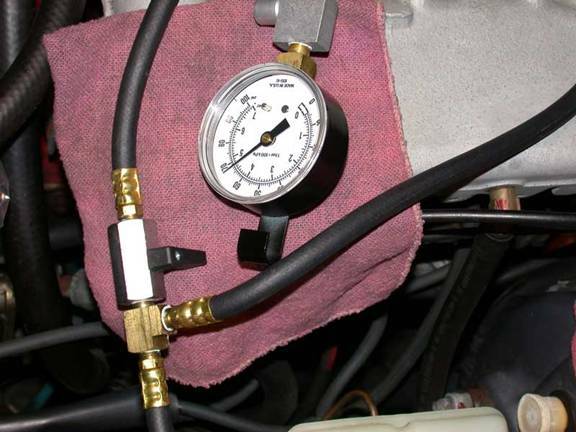 With no path to return the fuel to the tank, the control pressure rises to system pressure. The book calls for 65-77 pounds on this normally aspirated “F” engine. Line pressure on the turbo. 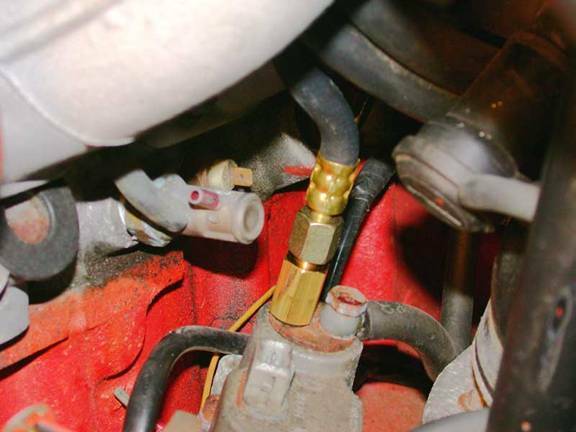 Another thing the turbo's handy fuel distributor makes easy is dumping the residual into the cylinder head by lifting the airflow meter plate. Don't flame me on this; I know I shouldn't wash the cylinders down.